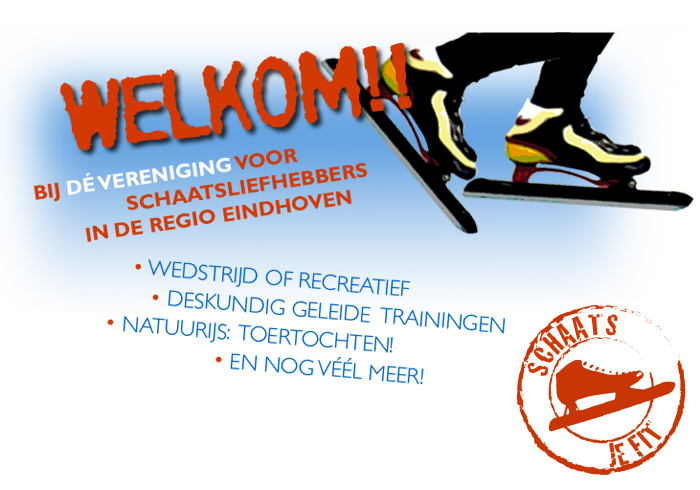 IJsclub Eindhoven (IJCE) is de vereniging voor schaatsliefhebbers in de regio Eindhoven. Beginner, ervaren wedstrijdrijder, jong en oud, iedereen is welkom bij IJCE! Bij IJCE kun je wedstrijdschaatsen of recreatief schaatsen. Je kunt deelnemen aan deskundig geleide trainingsgroepen waar je op je eigen niveau aan techniek en conditie werkt. Natuurlijk kun je bij IJCE ook leren schaatsen. Hiervoor hebben we speciale schaatsinstructiegroepen. En als er natuurijs is gaan we natuurlijk toertochten rijden. De ijsbaan is op maandagavond, zaterdag- en zondagochtend tijdens de trainingsuren alleen geopend voor IJCE-leden. Jeugdactiviteiten vinden vooral op zaterdagochtend plaats. Ook in het zomerseizoen kun je bij IJCE volop sporten. We trainen in de bossen van Waalre. Ook gaan we skeeleren en fietsen. Op deze wijze kun je optimaal voorbereid op het ijs staan, als de ijsbaan begin oktober weer open gaat. Neem dan deel aan een gratis introductie/proefles. IJsclub Eindhoven schaatst op de kunstijsbanen van het IJssportcentrum Eindhoven aan de Antoon Coolenlaan (sportcomplex Genneper Parken). Alle trainingen vinden plaats onder begeleiding van deskundige en gediplomeerde trainers. IJsclub Eindhoven verzorgt schaatslessen voor de jeugd. Jonge kinderen / jeugd wordt in deze groepen spelenderwijs schaatsen geleerd (op een overdekte 30x60 meter baan), meer gevorderde junioren krijgen les op noren op de 400 meter baan. Bij betrouwbaar natuurijs worden toertochten gereden. Dit gebeurt op de overdekte 400 meter kunstijsbaan en wel op maandagavond, zaterdagochtend en op zondagochtend. Ook bij het recreatieve schaatsen zijn er trainings- en instructiegroepen, maar zij zijn gericht op het verbeteren van de schaatstechniek en op duurtraining voor het rijden van toertochten. Dit vindt plaats op de overdekte 400 meter kunstijsbaan. IJCE heeft hiervoor de baan gehuurd op maandagavond en op zaterdagochtend. De baan is dan gereserveerd voor trainingen van wedstrijdsporters, van pupillen tot senioren. Deze trainingen zijn gericht op het echte langebaan rijden. Binnen IJCE wordt er tijdens dezelfde uren als de langebaan ook getraind door de marathongroep. Deze rijders hebben zich toegelegd in het werk van de lange adem. Binnen het gewest Noord-Brabant, Limburg en Zeeland is er een grote regiocompetitie, en daarnaast wordt er op de baan in Eindhoven en ook op de overige banen in het gewest een baancompetitie verreden. Zo kun je wekelijks wel een marathon wedstrijd rijden. De jeugd wordt ook niet vergeten, iedere baan heeft zijn eigen jeugdcompetitie marathon, de toppers vertegenwoordigen het gewest op het NK. IJsclub Eindhoven verzorgt ook shorttrack-trainingen op de 30x60 meter baan. Wil je leren om korte en snelle bochten te rijden? Kom dan zeker eens kijken. IJsclub Eindhoven (IJCE) is the speed-skating club for skating devotees in and around Eindhoven. Whether you are a recreational or a competitive skater, experienced or just leaning to skate, young or old, IJCE welcomes everybody. With IJCE you can participate in skating competitions or skate for recreation. You can improve your technique and endurance as a member of the different training groups trained by expert trainers. And, of course, you can learn to skate with IJCE. We have special instructors for this purpose. And when there is natural ice we will go skate touring. During the IJCE training hours on Monday evening, Saturday morning and Sunday morning the ice rink is accessible only for members of IJCE. Activities for the younger skaters take place primarily on Saturday morning. In the summer there are also plenty of sportive IJCE activities for you. We improve our condition in the woods near Waalre. We go on inline and bicycle rides. In that way you will be optimally prepared for the ice season when the ice rink opens early October. You can access the registration form here. This form is in Dutch. If you trouble completing this form please send an email to publicrelations@ijce.nl and we will help you. You can participate in two lesson without having to pay the fee and then decide if you want to be a member, or extend the try-out period with five more lessons (€ 60,- for adults, € 25,- for juniors) and decide afterwards. IJssportclub Eindhoven skates on the ice rink of the IJssportcentrum Eindhoven situated at the Anton Coolenlaan (part of the sports centre Genneper Parken). All groups are trained by experienced and certified trainers. IJsclub Eindhoven provides for skating lessons for children. The younger ones learn to skate in groups while playing (on a covered 30x60 meter track), the older and more experienced children are instructed on the 400 meter track. If the natural ice is thick enough IJCE will organize skate trips. This takes place on the covered 400 meter track on Monday evening, Saturday morning and Sunday morning. The training and instruction groups in this discipline aim for improvement of the skating technique and more endurance to be able to go on skating tours. This takes place on the covered 400 meter track on Monday evening and Saturday morning. The track is exclusively open for the training of the competitive skaters, ranging from juniors to seniors. These trainings prepare for skate competitions. During the same training hours also a marathon group is active. Members of this group set out to hold out for a considerable time. Within the region Noord-Brabant, Limburg and Zeeland an extended region competition takes place on the ice rinks of Eindhoven and the other regional ice rinks. Practically every week there is a competition on one of the ice rinks. The juniors are not left out; every ice rink has its own junior competition marathon and the leading skaters will represent the region during the Dutch national competition. IJsclub Eindhoven also provides for short-track training groups on the 30x60 meter track. If you want to improve your cornering technique, please come and see what we have in store for you. This is the only part of IJCE’s website in English. If you want more information about the training or introduction lessons, please contact IJCE via publicrelations@ijce.nl.